Liverpool Pembroke Sefton seniors had a great day out at Stretford in the second of the Northern Track and Field League match. They took a clean sweep of A & B contests in no fewer than eleven events. The men`s sprint strength was illustrated by their dominance the 100m, 200m and 400m individual events with the high hurdles thrown in for good measure. The Ormskirk trio of Michael Zaim(100m in 11.2), Phil Taylor(200m in 22.1) and Mark Grimshaw(400m in 49.1) were impressively backed up by Dave Readle and newcomer Kieran McGing. Zaim, Taylor, Readle and Grimshaw combined to take the 4 x 100m in a new club record of 43.1. Grimshaw, Taylor, McGing and Steve Donegan were also dominant in the 4 x 400 relay a shade outside the club record. The party did not stop there as Dave Readle and veteran Mark Line wiped up the Shot, Discus and Hammer events. Alex Ross and Adam Morris triumphed in the Long Jump then stepped back to see Dave Street and Liam Wignall do the same in the Triple. Elsewhere LPS`s women were also enjoying themselves Nicky Gore winning the Shot and Discus with strong support from colleagues Natalie Walsh and D Jansen. Unsurprisingly the local club won the match from the powerful Trafford outfit. The Young Athletes match at Bebington was less exciting but there were still nuggets to relish as Grade 1 performances were recorded by Under 17 Alex Stokes with a blistering 11.3 100m dash and Under 15 Nathan Hilton with a similarly eye catching 11.9. The Under 15 relay squads emulated their seniors in Manchester by taking the 4 x100m(Danny Higham, Nathan Hilton, Tom Kenningly and Simon Birch) and the 4 x 400m event. The Schools County Track and Field Championships are always a good pointer to future performances b, Liverpool Pembroke Sefton, relished a bumper weekend. Competing at Longford Stadium Stretford in the Greater Manchester Schools Natalie Walsh, a student at Winstanley College, exceed her personal best and shattered a club record with a winning throw of 36.33m in the Senior Discus. Her club-mate Anne-Marie Pennington was also busy in the Merseyside Schools in Birkenhead taking the gold in the Senior Javelin with 34.70. Ashley McComb`s relentless advance up the rungs of the High Jump continued as she notched 1.50 to climb on the top of the podium. Elsewhere a silver and bronze were collected by Katie Hughes (Inter 800m) and Stephanie Lucy (Senior 200m). Wigan also hosted the Lancashire Championships and Northern Junior Champion Mark Grimshaw one again demonstrated his class with a Senior 48.7 400m holding off the challenge of an existing international runner. Adam Morris was equally untroubled in collecting the Long Jump title with 6.06. Sam Hutchinson pleasantly surprised in winning the Inter 800m in 2.01.03 and watched middle-distance training partner, Jake Helm, secure a silver in the 1500m. Wayne Ashall took home a silver a in 53.1 400m and Luke Parker a bronze in the Javelin. Helen Green was second at 300m to complete an excellent day. the turn of Liverpool Pembroke Seniors at Manchester`s Sport City. The response was equally good with pride of place going to Dave Readle who easily scooped the Shot Putt title with 15.72m. He is clearly returning to the sort of form that gained him an international vest some years ago. Also, to prove that big men can run fast, he made the final of the 100m in 10.95, (10.99 in his heat) a time which is the best for an LPS sprinter this season. Loughborough student Phil Taylor had an equally good day just narrowly failing to take the 400m gold but in a scintillating 47.71. Sub-48 seconds is the benchmark of quality one-lap racers. Team mate, Kieran McGing also made the final, finishing 7th. Elsewhere Jimmy Boardman ran a good 14.58 5000m for 6th spot. Coach Merrik Bousfield`s trio of throwers, Kerri Massey, Anne-Marie Pennington and Natalie Walsh continued their relentless advance. In the Javelin Kerri captured 4th place with 34.94 with Anne-Marie only a few centimetres adrift in fifth in 34.87. Natalie Walsh was sixth in the Discus in a classy field. The Juniors meanwhile were at Connah`s Quay for a League match. Here the astonishing Michael Rimmer ran nearly as fast as Phil Taylor over in Manchester with a 400m time of 48.1. Needless to say it gained him the Man of the Match award. 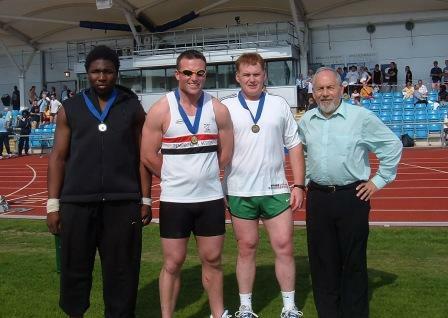 The Ormskirk-based club churns out quality 200m and 400m runners. This time though Mark Grimshaw forsook his favourite distance for a sharp 200m win in 22.8. Also eye catching was Rob Stocks first in the 3000m in 9.08.7. However, probably the most uplifting effort of the afternoon came from the indefatigable June Swift who stacked up points in several events but the most satisfactory will be her 800m win in a personal best of 2.19.1. Both the men and women teams finished second behind the North Wales composite club.